This is no surprise. In 2017 alone, water was a major factor in conflict in at least 45 countries, including Syria. Its importance as a resource means that water-related insecurity can easily exacerbate tensions and friction within and between countries. It can be weaponized; nefarious actors can gain control of, destroy, or redirect access to water to meet their objectives by targeting infrastructure and supplies. Advancements in cyber attacks on critical infrastructure raise further concerns as to the security of water systems. The World Economic Forum’s Global Risk Report (GRR) has listed water crises among the top-five risks in terms of impact for eight consecutive years. 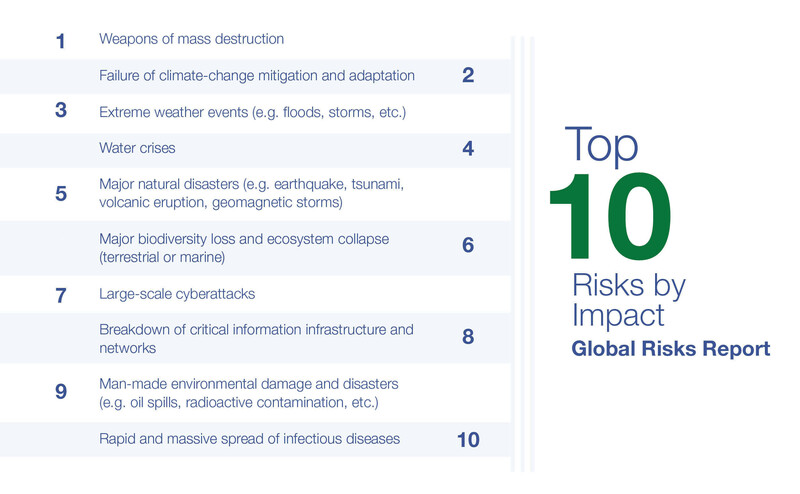 In the most recent version of the report, it remains nested among a cluster of other risks that are rated as having both a very high likelihood and a very high impact. These include extreme weather events, natural disasters, the failure of climate change adaptation and mitigation, man-made environmental disasters, biodiversity loss and ecosystem collapse, interstate conflict and large scale-involuntary migration. These risks are increasingly interconnected. Failure to mitigate climate change could lead to more extreme weather events, ecosystem collapse and a greater likelihood of man-made environmental disasters. All of these can exacerbate food and water insecurity, which in turn can lead to human deprivation, and could make these and other risks like migration and conflict more likely in a negative feedback loop. Around two thirds of the world’s population, or 4 billion people, currently live without sufficient access to fresh water for at least one month of the year. Further complicating the picture is the reality that securing water for food and economic activity will only become more difficult over time. As economies develop, their water consumption patterns shift and overall demand rises dramatically to meet the needs of food production, thirsty manufacturing and other industries, thermal power plants and households. However, water supplies are often damaged by poor management, pollution and over-consumption, in addition to supply-side reductions due to climate change impacts and the ecosystem degradation mentioned above. Many of these drivers of insecurity can be seen in the Inner Niger Delta area of Mali, a marshy wetlands along a stretch of the Niger river. Disruptions to the Delta’s waters, for instance through the construction of two upstream dams, risk destroying fragile ecosystems and further destabilizing the entire region. Altering downstream flows can jeopardize traditional economic activities that underpin the viability of Delta fishing villages, destroying livelihoods and exacerbating social tensions such as intergenerational friction. Combined with reductions in available farmland associated with rising temperatures and desertification, such environmental degradation risks further fuelling mass migration to the Malian capital Bamako and Europe. The journey is not a safe one, with criminalised trafficking routes that pass nearby between the West African coast and the Sahara. The history of radicalization in the region by extremist groups that have established themselves in northern Mali further illustrates the vulnerabilities facing the displaced and disenfranchised. People whose access to water is limited risk becoming increasingly marginalized, and a target for recruitment by radical groups. Water is critical to the region’s security. The Inner Niger Delta illustrates the critical role that water insecurity can play in exacerbating other risks, and the necessity of holistic policy approaches. Unfortunately, water insecurity is not yet taken seriously enough by all actors, despite its central role in our economies and in human lives and livelihoods. In most scenarios, the true security threat caused by water insecurity is not a ‘water war’, but rather in its secondary impact on associated human security, that which can then exacerbate local, regional and international security threats. It can impede or reverse economic development, and prevent countries from playing their art in achieving the Sustainable Development Goals. It can also affect the private sector, for instance by affecting critical parts of complex supply chains. Robust solutions to the water security challenge are critical for everybody from public policymakers and businesses to the wider public and the international community. A new generation of public-private partnerships can be part of the solution to such complex and interrelated risks, responding with urgency and innovation to manage the ‘less for more’ challenge of reduced supply and increased demand. Advances in technology can play an important role in this new era of collaboration. Real-time data is already being used to generate insights about the interplay of risk factors, allowing the development of sophisticated early-warning tools. The Water, Peace and Security Partnership partnership, for instance, crunches vast amounts of data, using machine-learning and other technologies to identify patterns that indicate the high risk of a conflict situation developing. It does not simply flash a warning light, but points to the factors that need to be addressed through capacity-building and stakeholder engagement to mitigate any potential conflict. The tool, presented to the UN’s Security Council in 2018, aims to build cohesion for collective action among diplomats, defence analysts, development and humanitarian experts and environmental scientists. Another partnership, Digital Earth Africa, is developing an open-access platform of analysis-ready geospatial data for public use that will enable African nations to track environmental changes across the continent in unprecedented detail, including flooding, droughts, soil and coastal erosion, agriculture, forest and land-use change, water availability and quality, and changes to human settlements. Such insights can help governments, businesses and communities better understand and address the interconnected web of environmental risks, in particular the impacts of climate change. From variations in rainfall patterns to extended periods of extreme weather events, building resilience across agricultural, industrial and domestic water supplies is a key priority for increasing water security. The complex challenges and impacts of water crises will certainly make it difficult to shift from the top of future global risk lists. But real progress can be made, especially through cross-sectoral partnerships and platforms that can engage with such complexity. The 2030 Water Resources Group, which works across a network of more than 600 partners to tackle the water supply-demand gap in 14 different geographies, is a promising blueprint for effective public-private cooperation. Access to better data can bolster such collaborations and lead to more effective solutions, for instance through mapping water risk, and generating greater understanding of how physical water shortages affect societal tensions, political disruptions and cross-border migration. These are just a few examples of how the world is already developing the types of ‘next generation’ insights, tools and partnerships needed to tackle water insecurity. But what the Global Risk Report makes clear is that any solution needs to be underpinned by an increased awareness of the scale and interconnectedness of the water security challenge before us.